I think there’s some truth in this description, but I also think that the analysis could be deepened. From my own experience, in a public research university, and in a pluralist department with a full complement of advanced degrees in sub-fields (literary studies, creative writing, rhet/comp, linguistics, and with a growing interest in digital humanities), it’s taken for granted that we must work together, even if it does make all our lives more complicated. It does make inter-departmental conversation more difficult at times, but perhaps more rewarding, too. (I don’t deny that we all wonder from time to time what it would be like to work in a stand-alone department squarely focused on what we do). But I think that for all but the most prestigious and super-endowed programs, disciplinary autonomy is off the table. As I continued to read through Bousquet’s essay, it seemed to me that all but a handful of my friends and colleagues in the academy work in similarly mixed environments. The remaining ones work in institutions either so prestigious that they could ignore the market forces he describes, or so oblivious (or, more likely, divided) that nothing short of catastrophe could make them change direction. Frankly, by the time Bousquet writes, “the moral panic doesn’t exist in the hundreds of programs that have kept up with the changing conditions of textual production,” I wondered why this essay wasn’t just an email to his colleagues at Emory? In other words, why should the rest of us care? At the same time, I do think that there’s a potentially useful discussion to be extracted from this essentially local argument. I think in the long term and among a very broad group of working scholar/teachers, there’s a lot of justifiable anxiety about the future of what we might call “traditional” or historically-based literary studies. This anxiety comes not (just) from the insecurities of superannuated or inactive faculty, but from the increasingly market-driven language used to justify the reorganization of academic departments wholesale in domains like hiring, tenure, enrollments, and so forth. The once-dominant model of nation- and period-specialization has just weathered serious challenge from the MLA leadership this past winter, and left many eighteenth-century scholars wondering just what role we shall have in that organization as it goes through its own evolution (not that the MLA has demonstrated much love for rhet/comp, either). So I wonder what sort of role literature and literary studies might have in the undergraduate and graduate curricula of “English studies” twenty years from now. For example, in a pluralistic department organized without period categories, how would historical research be taught, or the general category of “literature” be usefully sub-divided or segmented? How would “genre” be studied? And so forth. In my view, a large part of this “anxiety” reflects our awareness that many familiar landmarks in scholarly life are disappearing, with little concrete sense of what’s to replace them. I have two thoughts about this stand-off between Bousquet and the resistant literature faculty he describes. First of all, because of the depressingly straitened circumstances outlined by Bousquet many times before, a lot of literature faculty–even the ones trained in the Ivy Leagues–have made heroic or at least incremental efforts to adapt their curricula, teaching, and their research interests to their new surroundings and new students. In other words, the period-based fields have not in any way stood still in the past few decades. This fact really became clear during the MLA dust-up, when eighteenth-century scholars were forced to argue to scholars from other historical periods against shrinking our division at the annual meeting. Not only were the proposals a self-defeating gesture for an organization purporting to represent the entirety of “literary studies,” they would jettison every trace of the field’s development over the past thirty years. So I think anyone in Bousquet’s position would be much better off encouraging more, and better, adaptations among literature professors rather than threatening them with “irrelevance.” I don’t think high quality collaborations can occur under any other circumstances. My second point is that it feels odd for Bousquet, of all people, to use the language of the market to justify the de facto institutional changes he wishes to make. I have long admired How the University Works precisely because it questions the use of the marketplace or its organizational jargon to justify educational decisions that affect people. Anyone who has spent time in higher education knows that the market is not in any way a fair or rational arbiter, nor is it an impersonal historical force, but something that produces certain outcomes because of certain prior decisions and priorities. Assuming that this is the case, the changes taking place now are driven in part by all the forces he’s rightly critiqued elsewhere: permatemping, public disinvestment, corporatization, etc. The economic-institutional process that elevated rhet/comp to its current position (however resisted by a few outliers) may also hollow out the academic departments that may someday be filled with majorities of rhet/comp teacher/scholars. So the market has spoken, but why exactly should we follow its dictates here or elsewhere? From my perspective, it might be better to envision (and enact) a version of “English studies” that is able to draw upon the expertise of all its fields, including the historical study of literature. I finished Scholes’s Rise and Fall the other day, and when I was done I felt that it was a lucid attempt to grapple with the largest questions surrounding the future of English Studies, as these problems were perceived circa 1998. Some of these issues still seem apposite, like the relation between K-12 and higher ed teaching; some, like his meditations on theory in the classroom, less so. However, I left it wishing, perhaps a little unreasonably, that it had been written a little more boldly. One of the problems that I had with the book was that it seemed specifically addressed to an audience of tenured, historically-based literature specialists who seem a lot more marginal now than they did in 1998, without it having much to say to the once-marginalized groups (the rhetoric and composition specialists, the creative writers, the underemployed adjuncts or the ambivalent graduate students) who really do make our departments different than they were in the 80s or 90s. The idea of academic research as a “contribution to knowledge,” the ideal of “original research,” requires an assumption of progress toward more adequate descriptions of reality. In the sciences, research receives its justification and its support–despite all the lip serve to “pure” knowledge–from the exploitable discoveries or patents to which it may lead. In the humanities, research receives its justification–despite all the lip service to the advancement of learning–from its applicability to teaching. In fact, I would say that all important research in the humanities is simply teaching by other means than the lecture or the seminar. And conversely, published work in English studies that has no use in teaching or makes no contribution to learning is unimportant–trifling stuff. When Chaucer said of his Oxford Clerk that he would gladly learn and gladly teach, he was implying that the two activities were connected by more than the repeated adverb (172). I happen to think this is true, and I was happy to see a figure like Scholes saying this as directly as he does. Having said that, it seems that all the growth areas in literary scholarship are occurring in fields developing a dimension of exploitable discovery in their research, either in the hopes of Digital Humanities scholars to digitize, assemble, and analyze unprecedented amounts of verbal materials from the past and present, or in the continued effort to assemble, collect, and analyze more and more literary and cultural productions in the present from groups previously underrepresented in our cultural record. So here’s my question: do we need to recognize Scholes’s allusion to Chaucer to conduct such research? And how might this kind of research activity relate to curricula and teaching, if this is where the scholarship of the field is indeed moving? a quick note about corporatization of universities, museums, etc. . . .
As both Matt Yglesias and Atrios have pointed out, we seem to be living in an era when the ethical norms surrounding the conduct of business have reached all-time lows, and where all sorts of bad practices can be rationalized with principles like “profit maximization” or “shareholder value.” In essence, the marketplace is the place where everyone steals everyone else’s lunch, and where everyone must guard against their neighbor. Not a very productive arrangement, is it? What I’ve noticed is that even in the face of widespread disapproval of such predatory, unaccountable behavior, the elites who run public entities like public universities and museums still insist on using this rhetoric to justify their decisions. So what does a public university look like when it’s run for the purposes of “profit maximization” or “shareholder value,” to the point where Presidents or Boards are supposedly obligated to choose these kinds of values over the more traditional missions of the university, like the “pursuit of knowledge,” the “liberal arts” or even “educational effectiveness”? It also seems to me that if the historical practices of the “for-profits” are any guide, any university run under these principles of maximization will quickly, and necessarily, begin to engage in duplicitous behavior: students will be promised one kind of education, and provided something very different. These schools’ profit-margin derives not from reputation, but from their ability to capture the most vulnerable students and educate them as cheaply–and as superficially–as possible. And the universities that do not care to run themselves this way will be competing with those who do. In my view, what happened at UVA suggests the benefits of faculty publicly aligning their interests with those of their students, their parents, and especially, their institutions’ alumni. This made the BOV’s claim to represent the “public’s” supposed desire for “efficiency” and “strategic dynamism” risible, and it revealed the isolation of the Dragas faction of the Board from the rest of the university community. There will always be multiple claims upon “the public,” and multiple claims to speak “for the public,” and faculty can help groups like students and alumni recognize how their own needs are being ignored in the drive to ever-greater efficiency. This seems to me the best lesson to take from the recent events at UVA. I don’t want to hijack the still-emerging discussion of Cynthia Richards’s excellent post on the limits of teaching cultural studies in a small liberal arts college, but I did want to call people’s attention to the historian Tim Burke’s cogent response to Warner and Siskin over at his blog, Easily Distracted. Burke raises an interesting question: does the process of disciplinary change really follow our legitimating narratives of change? What’s interesting in these moments is that they reveal how disciplines are not really markets, nor are they composed of a series of persuasive speech acts, though we sometimes act as if or claim that either or both are true. E.g., we sometimes argue that disciplines change because their practicioners have new interests, priorities or techniques, that they have a supple if slow-paced response to a kind of intellectual market. You write what you think is important, and the field either “buys” it or it doesn’t. And we sometimes say that the priorities of a discipline are determined by persuasion: that scholars do work and then argue for its importance or necessity. If they argue well, ta-da! knowledge. As you might suspect, the actual development of disciplines, as debates like this show, is not so simple. And these accounts, he argues, have important implications for the discussions a number of literary scholars have been having lately about justifying the humanities in the contemporary university. Take a look, and tell us what you think. today’s thought . . . .
What would universities, departments, classes look like if they were organized, as Daniel H. Pink suggests, around the principles of autonomy, mastery, and purpose? What would our research or our teaching look like in such a setting, and what kind of work would we invite our students to produce? PS: As I write this, I am thoroughly aware that much of the chatter about education, whether neoliberal or conservative, seems completely unaware of the complexities of motivation, either from the students’ or the teachers’ perspective. But it’s high time for this problem of motivation to be brought into the discussion of learning and incentives. Presumably, if you were an English major at college, it means that you didn’t spend a lot of time looking at graphs, and you were more than likely female. 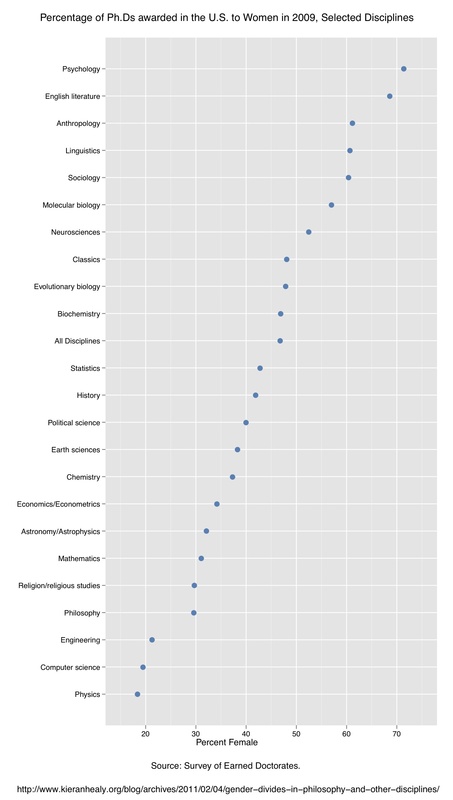 This graph is courtesy of Kieran Healy’s post, which is about the gender divides in academic philosophy. Take a look at the post but also the comments. Incidentally, asking “Hey, how can it be sexism if Education and English are full of women” thing is similar to asking “How can there be Global Warming if we just got three feet of snow in DC?” Global warming, narrowly construed, is an aspect of climate change, and an explanation of it requires a theory of climate systems. Sexism, narrowly construed, is an aspect of gender relations, and an explanation of it requires a similarly more general theory. So what would that more general theory look like, if it were to comprehend both English and Philosophy departments, alongside Physics, Computer Science, and Engineering? As a follow-up to Laura’s post, I wanted to pass along some links to responses from British scholars and academics to the proposed cuts in Humanities funding, first from Gavin Robinson’s history blog Investigations of a Dog, then from economist Will Davies’ Potlatch. I could try to synthesize their very disparate analyses, but I think the most important convergence between the two is their emphasis on the importance of historical knowledge as a mode of critical reasoning. In Davies’ terms, this amounts to a picture of social and economic relations that in their historical complexity cannot and should not be reduced to present-day market valuations, because any “form of justice [should be understood as] extremely path dependent and fragile. Different spheres of inequality [understood as rival elites and the values maintaining them] must be allowed to emerge organically, and then be kept strategically separate.” Davies’ concerns about Britain’s emulation of American neo-liberalism perhaps makes him a little too sanguine about the effects of these ideologies in the American context, but I think it’s necessary to conceive of academic values as he does, as working alongside marketplace values in a necessarily pluralistic ideological environment. It seems obvious to me that independent critical thought, textual analysis and the ability to construct and destroy arguments are all very important skills, not just for individuals but for society as a whole. It’s equally obvious why politicians, businessmen and journalists might be hostile to those skills. When humanities departments ask for funding, they’re effectively saying “please give us your money so we can teach people to see through your lies”. That’s going to be a hard sell, and probably explains why defenders of the humanities tend to use vague euphemisms rather than putting it so bluntly. The paradox is that the humanities have to cover up their main selling point so as not to appear threatening to the people with money and power, but that makes it easy to represent the humanities as useless. So the problem faced by humanities scholars nowadays is not so much the uselessness of what they study, but the fact that their authentic use automatically puts one at odds with both the governmental and business interests that dominate the operations of the modern-day research university. Davies is concerned, as I am, that this season’s political attacks on the university amount to a concerted political assault on the Enlightenment. But to what extent does the modern research university reflect the values of Enlightenment?